The East Timor and Indonesia Action Network (ETAN) today urged the U.S. Senate to act quickly and pass Sen. Tom Udall's (D-NM) resolution calling on the U.S. government to "make available to the public all classified records and documents concerning the mass killings of 1965 and 1966" in Indonesia. The resolution, introduced on December 10, Human Rights Day, "condemns the mass murder" and "expresses great concern about the lack of accountability enjoyed by those who carried out crimes during this period." "The peoples of the U.S. and Indonesia deserve to know the full truth about these events. The U.S. must declassify and release all files related to Suharto's U.S.-backed seizure of power and the horrific events which followed," said Chris Lundry of ETAN. "The U.S. assisted and praised these events," said John M. Miller, Coordinator of ETAN. "Those in the West who encouraged the mass violence in Indonesia should be held accountable. For too long, impunity has allowed many of the perpetrators to prosper, while survivors and the families of the victims continue to suffer," he added. The resolution singles out the Department of State, the Department of Defense, and the Central Intelligence Agency as "involved in developing and implementing policy towards Indonesia" at that time. And calls for them "to locate, identify, inventory, recommend for declassification, and make available to the public all classified records and documents concerning the mass killings of 1965 and 1966, including records and documents pertaining to covert operations in Indonesia from January 1, 1964 through March 30, 1966." 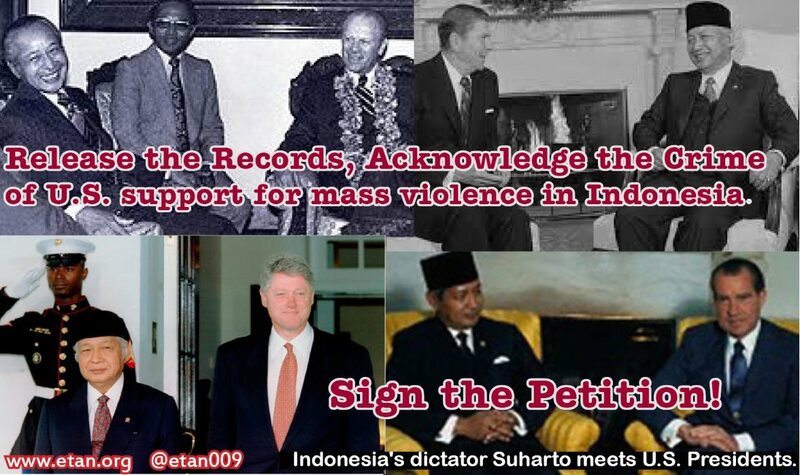 ETAN is circulating a petition (http://chn.ge/1v50Edj ) urging the U.S. government to acknowledge its role in mass violence in Indonesia and release all its records concerning the events that resulted in the Indonesian dictator's seizure of power. The massacre of between 500,000 and 1,000,000 (and possibly more) communists, leftists, ethnic Chinese, and others in Indonesia in 1965-1966 is a foundational event in modern Indonesian political history. These massacres brought the brutal Indonesian dictator Suharto to power. His three-decade dictatorship was backed by the U.S., which provided weapons, military training and political support. 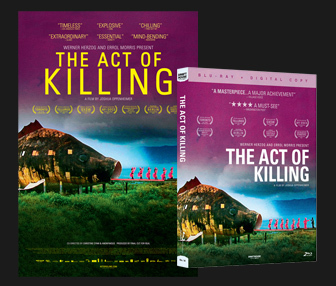 Recent documentaries, including The Act of Killing and The Look of Silence, have fueled a debate within Indonesia and drawn attention internationally to events kept out of many U.S. history books. Events that the U.S. facilitated and cheered at the time. The list of human rights violations during Suharto's New Order is lengthy, including the mysterious shootings incidents of the early 1980s, the 1984 Tanjung Priok massacre, and the persecution and killings in West Papua and Aceh. Among the most egregious was the 1975 invasion of former Portuguese colony and newly-declared independent state Timor-Leste (East Timor), where up to one-third of the population died in the years following the invasion. Throughout all of these human rights disasters, the United States remained firmly on Suharto's side, pledging financial and political support, encouraging investment, and perhaps most troubling, providing military aid and training, at times contrary to the wishes of the U.S. Congress and in violation of U.S. law. The East Timor and Indonesia Action Network (ETAN) was founded in 1991. 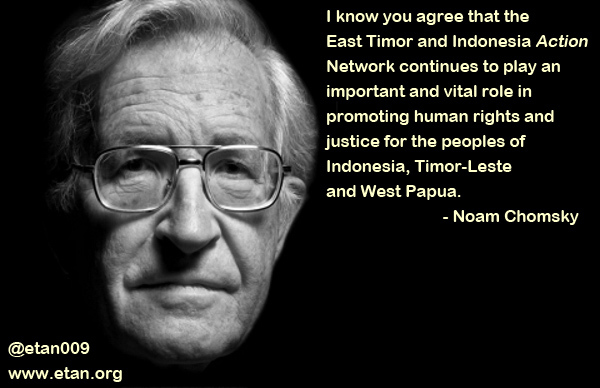 ETAN supports democracy, human rights and justice in Timor-Leste, West Papua and Indonesia. Website: www.etan.org Twitter: @etan009. surrounding the mass killings during 1965�66. Expressing the sense of the Senate regarding the need for reconciliation in Indonesia and disclosure by the United States Government of events surrounding the mass killings during 1965�66. (C) submit a report to Congress describing all such records, the disposition of such records, and the activities of the Interagency Group. Madame President, our nation and Indonesia enjoy a strong relationship, reflected in the U.S.-Indonesia Comprehensive Partnership of 2010. This partnership is robust and growing. It serves both our countries, for bilateral, regional and global cooperation. The election of President Widodo in July is a step forward, part of a great democratic transition over the past two decades in Indonesia. We are working together -� for economic growth, for the environment, and for our security. This is progress, and to be encouraged. Indonesia has a major role to play, as a regional and global leader. But, in that role, it must be an inclusive democracy. Key to this is to address past human rights abuses, specifically the mass murders committed in 1965 to 1966. Next year is the 50th anniversary of these killings. I rise today -� International Human Rights Day -� to introduce a resolution concerning these events, which Indonesia�s own Human Rights Commission has labeled a crime against humanity. But, let me be clear. This is not a censure of the people of Indonesia or Indonesia�s new government. It is an opportunity for justice and for reconciliation. The events took place decades ago. The reasons behind them are complex. But, that cannot justify ignoring the past or forgetting those who suffered under it. Nor can we ignore our own government�s role during that time. My resolution proposes two things. First, I urge Indonesia�s new government to create a truth and reconciliation commission to address these crimes. Second, I urge our own government to establish an interagency working group and to release relevant classified documents. We should make clear what was known to us, and we should make this information available. It is a painful history to recall. On October 1, 1965, six Indonesian Army generals were killed. According to scholars, these generals were killed by military personnel. But their deaths were blamed on Indonesia�s Communist Party, which was used to justify mass murders. The next few months were horrific for the Indonesian people. The C.I.A. has called it one of the worst periods of mass murders in the twentieth century. Hundreds of thousands were killed. Many others were imprisoned, tortured, raped, starved, and disappeared across the country. These individuals were targeted for their alleged association with Communism, but they came from all walks of life, including women�s groups, teachers, intellectuals, and others. Most were unarmed, and none had due process of law. The U.S. provided financial and military assistance during this time and later, according to documents released by the State Department, and General Suharto consolidated his power, ruling from 1967 until 1998. Some may ask. Why is this resolution needed? Why now? 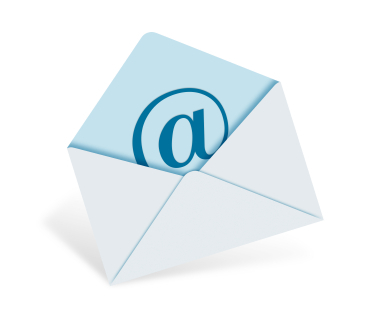 Here�s why. The survivors, and descendants of victims, continue to be marginalized. Many of the killers continue to live with impunity. Very few Americans are aware of these historical events, or our own government�s actions during this time. These events demand our attention and resolution, as we work together to build a strong Asia Pacific region. I am proud to serve on the Senate Foreign Relations Committee. An important goal is the development of peaceful, stable democracies -� democracies that provide security and hope to their own people, and economic opportunity with businesses in my state and across the U.S.
Indonesia is the world�s third largest democracy. Its population is diverse. It has the largest Muslim majority population in the world. It has faced many challenges, and continues to move forward. A strong U.S.-Indonesia relationship benefits both our countries. I offer this resolution in support of that relationship, and Indonesia�s continued progress as a growing democracy and a vital U.S. ally.